But before you start filling your shopping cart with protein-enhanced foods in the hopes that they'll help you get leaner, stronger or fitter, here are five facts to consider. Protein is the nutrient of the year -- with more than half of all adults trying to get more of it into their diets, according to NPD Group, a market research firm. To help, food companies are pumping more protein into everything from breads and cereals to snack bars and smoothies. While more than half of adults are trying to get more protein in their diets, some 71 percent say they don't know how much protein they're supposed to eat, according to the NPD group. The recommended dietary allowance (RDA) for protein is .8 grams per kilogram body weight (about 60 grams protein for a 150-pound adults), but that's the minimum amount needed for sedentary adults to prevent a deficiency not the amount considered an optimal for maintaining a lean body mass. A more optimal goal amount is 1.5 times as much as the RDA or 1.2 grams protein per kilogram body weight or about .5 grams per pound. (If you weigh 200 pounds, that's 100 grams protein per day.) The American College of Sports Medicine recommends endurance athletes need 1.2 to 1.4 grams per kilogram (.54 to 63 grams per pound) and bodybuilders need 1.6 to 1.7 grams protein per kilogram body weight (.72 to .77 grams per pound). National nutrition surveillance data show that the men average around 100 grams of protein per day and women eat 68 grams per day, but most active people eat more protein, so it's likely that you already eat enough protein. A typical U.S. diet has very little protein at breakfast, adequate amounts at lunch and too much at dinner. In fact, we eat about three times as much protein at dinner as we do at our first meal. That's why a total daily protein goal is good to know, but it's not as important as how protein is divided into meals and snacks. Eating excess protein at one time is essentially wasted as the body can only utilize the essential amino acids present in about 30 grams of protein. And, if weight loss is what you're after, a protein-rich first meal is the most important to help curb appetite and cravings for carbohydrates throughout the day. "Our research shows that eating about 30 grams of protein at breakfast, lunch and dinner is more beneficial for muscle protein synthesis than eating a large amount at dinner," explains Douglas Paddon-Jones, Ph.D., professor of nutrition and metabolism at the University of Texas Medical Branch at Galveston, TX. 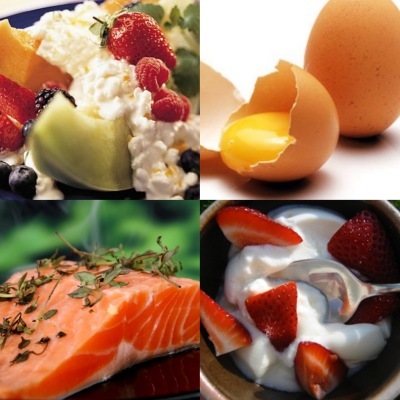 The study, reported in the Journal of Nutrition found a 25 percent increase in muscle protein synthesis when protein is divided into three, 30-gram doses at breakfast, lunch and dinner compared to eating the same total protein (90 grams) but in this distribution pattern: 11 grams protein at breakfast, 16 grams at lunch and 63 grams at dinner. There's No 30-Minute "Anabolic Window of Opportunity"
Despite what you may have heard from your trainer or read in popular articles, research doesn't support the notion that there is a 30-minute window of opportunity to get amino acids from protein to your muscles post-exercise to optimize muscle protein synthesis. In fact, new research shows that the immediacy around protein intake post-exercise for strength athletes is grossly exaggerated. For strength athletes, several studies show that the body's muscle-building capabilities are enhanced for at least 24 hours after hard resistance training, so as long as you train hard and get enough quality protein in your diet, you don't need to worry about drinking your recovery beverage as soon as you've completed your last rep. The bulk of the scientific evidence shows that, unless you're a vegetarian or vegan, you can easily obtain all the essential amino acids necessary to optimize muscle protein synthesis by eating real foods. The key is getting enough of the nine essential amino acids, with particular attention to leucine, the branch chain amino acid that directly stimulates muscle protein synthesis. Leucine is found in ample amounts in dairy foods, poultry, fish, beef, beans and eggs. If you eat 30 grams of protein from a variety of high-quality protein foods you should get about 2 to 3 grams of the amino acid, which has been shown to optimally stimulate muscle protein synthesis. Vegetarians may need supplemental protein to get enough leucine in their diets. Many active individuals believe that eating more protein equals more muscle. Not so. Protein alone does nothing to build muscle tissue: a progressive training regimen is necessary to provide muscles the constant challenge they need to continue to adapt (read: get stronger). Muscles adapt quickly to the demands of exercise, so it's important to keep exercise constantly varied to see the best gains in lean tissue. And, if you're eating more protein to lose weight, you need to eat fewer calories than your body needs. Period. If you up your calories from protein, you need to remove calories from carbohydrates, fats or alcohol to create a calorie deficit that promotes weight loss. 1. The Journal of Nutrition, "Dietary Protein Distribution Positively Influences 14-h Muscle Protein Synthesis in Healthy Adults."